Mr. Max Molander guides students to find and develop their own artistic voice. His truly adaptable teaching style hones in on individual goals while using students’ favorite songs to build a solid framework of musical knowledge and intuition. The power of music and emotional aspects of songwriting are emphasized from the beginning. No matter your skill level, Max’s focus is more on your development as a musician than as just a guitarist or pianist. Especially in the beginning, the emphasis is on playing songs that you connect with to develop a connection with your instrument and a love for music. Later on, even the youngest students are exposed to music theory concepts to lay the groundwork for musical fluency. songwriting that he is eager to share. Max’s teaching background started early in life as a counselor for a skateboard and bike summer camp. For 5 summers he worked with children ages 4-14, learning how to communicate the same idea from different perspectives. He loves to teach and continued tutoring math and music through high school and college. produced the EP. Since the move Mint Trip has been consistently gigging around L.A. at venues such as The Whisky a Go-Go, The Mint and the Hotel Cafe. 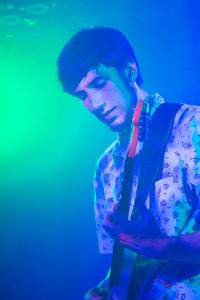 The band’s minty fresh sound involves incorporating a variety of influences from jazz, electronic pop, indie rock and heavy music to push the boundaries of pop music. Before starting Mint Trip, Max played almost every style of music that involves the guitar. Growing up in Raleigh, North Carolina, he performed at farmers markets with folk bands and at rock clubs with post-punk bands. In addition to guitar, Max plays drums, keyboard, bass and ukulele. Now he is putting his vast musical background to work for you, helping to discover the world of music and unleash your potential!